The follow up to our highly rated 2001 release, the 2002 is unquestionably the finest Pinot we have yet bottled. This wine encapsulates what I personally love about Russian River Pinot Noir and is the product of special vineyards and patient winemaking. The Occidental Vineyard has long been our most distinctive and Burgundian source, its twelve-clone field blend producing wildly complex, succulent wines. Add to that the brilliance of the Old Beringer selection at Jewell vineyard and the earthy structure of Widdoes and you have the makings of a truly complex offering. In our experience it is rare for Californian Pinot to take on the guise of Grand Cru Burgundy, but we believe we have come close with this bottling. When a pedigree vineyard is farmed to its optimum level it can produce fruit that ripens fully at lower sugar so that alcohol levels are not elevated, acidity is in balance and flavors become dark yet (most critically) retain vibrancy. It is rare for Californian pinot vineyards to achieve all three in unison but the 2002 growing season afforded us just such an opportunity and we are confident we took full advantage of it. 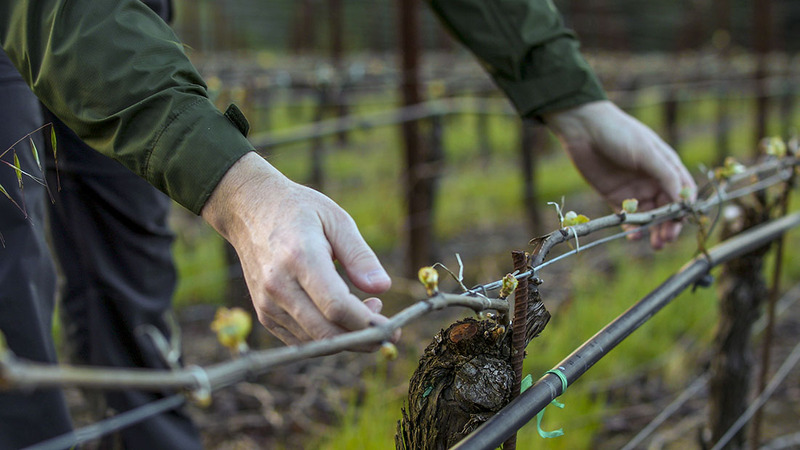 Occidental Road's small vines and restrictive soils produced their lowest yields yet. Similarly Jewell suffered from poor flower pollination to produce loose clusters and tiny berries. Widdoes, a more reliable producer, set a normal crop that required post-veraison fine-tuning to balance the vines. Such loose clusters allowed greater sunlight penetration onto the stem and it was clear at harvest that the possibility of true stem ripeness was not an exclusivity of our Burgundian colleagues. The level of fruit intensity and natural extract at harvest was astonishing. With fruit of such concentration, winemaking inputs become less intense as the fruit is easy to extract. It offers itself up for the taking. It becomes a matter of balancing the extraction with structural elements to preserve balance, vibrancy and ultimately capture delicacy and harmony. Tannin density was prolific so that lees aging was crucial to buffer the mid palate and flesh-out the wines. This also provided the opportunity to lower sulfur inputs significantly and allow the wines to develop naturally and at their own pace. Increased new oak from fine-grained, slow extraction forests was the perfect framework for the blend to develop over fifteen leisurely months in barrel. A deep ruby-red color leads to deep toned aromas of cassis, violet, truffle and smoke. The palate is dark and penetrating with dense black fruit extract, dried thyme, game nuances and brighter sweet red berries. The backward structure is tightly wound and currently clamps down on full mid-palate textural development. Yet the integration of fruit, oak influence and structure is in the early stages of harmonizing. I suggest trying a single bottle on release to gauge your enjoyment level but advise cellaring for 3 to 4 years to allow the wine to fully integrate and realize its true potential.